Five color-coded professional gym quality rubber tube bands can be used alone or stacked in any combination up to a maximum equivalent of 100 lbs of resistance. Each band is 1.4m long and is clearly marked with its equivalent weight - a feature you won't see on most exercise bands sold elsewhere. Strong rubber bands provide consistent resistance for every movement and give you enough flexibility to do hundreds of different exercises from beginner level through advanced. Virtually guarantees you'll never grow bored of your workouts. The included guides will help you in varying your routines and adding new exercises to challenge yourself to grow past your initial comfort levels. Order Your New Set of Resistance Bands Today and Discover the Best Workout of Your Life - Right in Your Own Home. 5 COLOR-CODED BANDS INCLUDED - Yellow (10 lbs), Red (15 lbs), Blue (20 lbs), Green（25 lbs) and Black (30 lbs), the total resistance is the sum of the two sides,all bands are 55 inch in length. 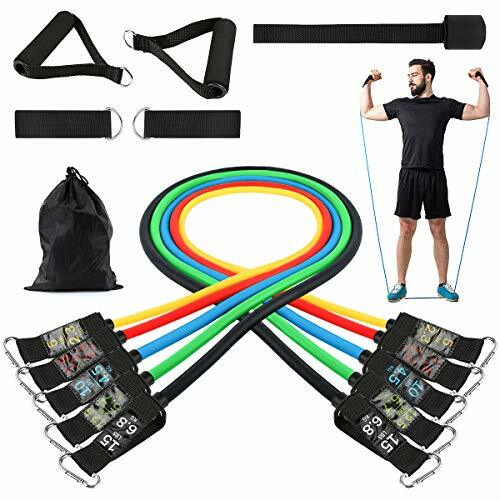 YOUR OWN PERSONAL HOME GYM - This premium resistance band set includes a door anchor and two ankle straps to allow you to perform the widest variety of resistance training exercises possible. Great for toning your quads, glutes, buttocks, abs, biceps, triceps, legs and knees. 100% MONEY BACK GUARANTEE - Please feel free to contact us for replacement or refunds if there are any issues with your purchase. If you have any questions about this product by Turefans, contact us by completing and submitting the form below. If you are looking for a specif part number, please include it with your message.